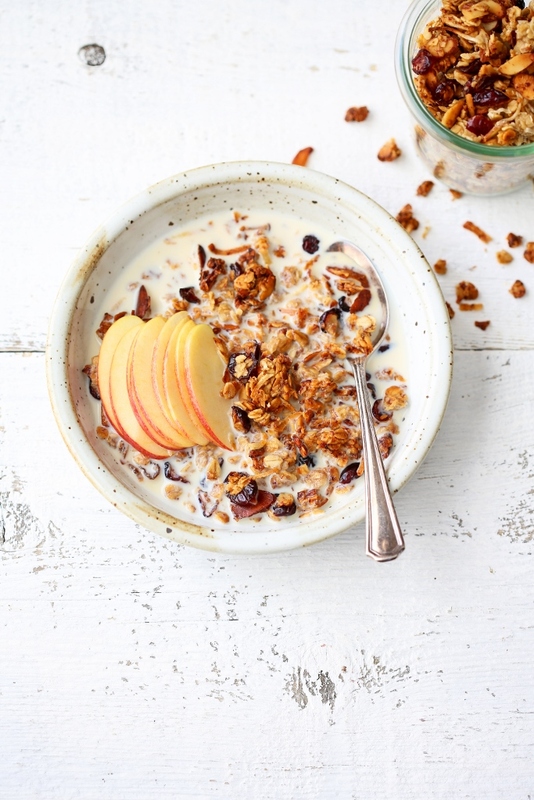 A while back we promised that we would share our banana granola recipe so here it is. We find ourselves making banana nut bread and banana granola when we have an abundance of overripe bananas. I like to make the most of our oven so I bake the banana bread first, then turn down the temperature for the granola once the bread is done. 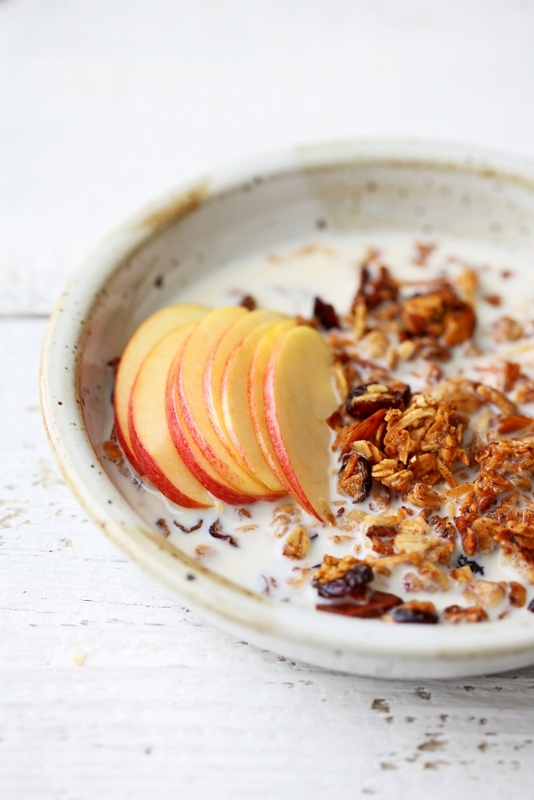 When baked right, you get clusters of soft and moist granola with rich banana flavor. This is hands down Vu’s and Aiden’s favorite granola. I pack this banana granola as a snack for Aiden when he goes to school. It’s also our go to breakfast or snack when we don’t have time to cook, and we go through a batch just about every week. Hope you like it! 2. In a food processor, combine the bananas, honey, and coconut oil and blend until smooth. 3. Place the oats, coconut threads, almonds, and cranberries in a large mixing bowl. 4. Pour the banana mixture over the dry ingredients and mix to coat. Make sure all the oats are moistened. 5. Spread the granola evenly on two baking sheets lined with parchment paper. 6. Bake in the oven for 60 minutes or until golden and dry, making sure to turn the granola with your spatula every 15 minutes to ensure even color and to prevent it from sticking to the pan. 7. 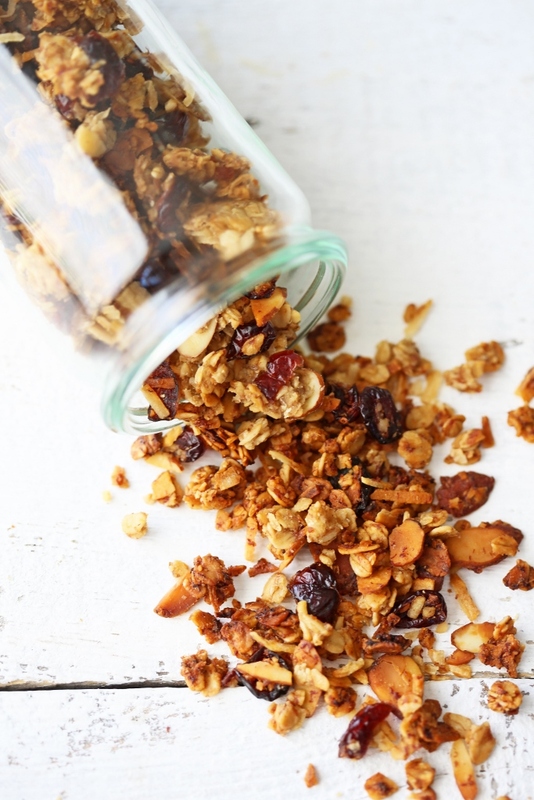 Set the granola aside to cool to room temperature and crisp up. 8. Transfer to an airtight container and store up to a month.